Next time you go the gym or wherever you train, take a look around. Look at the your friends, the people you work out with, anyone you see there on a consistent basis. Are they making changes and moving toward the goals they have set for themselves? Do they look better…move better…feel better? Now look at yourself and ask the same questions. If the answers are yes, then you are doing great! Keep up the good work. If the answer is no to one or more of these questions then maybe it’s time to make a change. A change in the way you are attempting to reach your goals. A change in the way you are training. 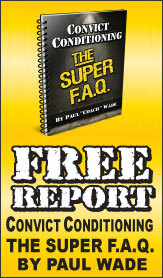 Carl Sipes is a personal trainer/strength coach that believes results are the bottom line. Carl has been helping people reach their health and fitness goals for close to 10 years. He has worked in a variety of settings including a private studio and chiropractic clinic. Now he owns his own business, Method Training. Carl has successfully worked with a wide variety of people ranging from the college athlete coming back from an injury, the business person with little to no extra time in their schedule, stay at home moms or dads, to the experienced senior. Through his formal education and extensive continuing education Carl can get you started on the right track or out of your training rut and on the fast track to shattering any current and future goals you may have. Completed my RKC I with Carl this past May and he was a great motivator. Kept our spirits up when we struggling or fatigued and knew when to approach to coach you through a movement. Was vocal but not in your face and always brought good energy to the class. 10/10 Positive and Detail Oriented! Carl was one of the instructors when I took my HKC in Milwaukee this past February (2015). Carl was a great teacher - very positive and took time to explain the details. I was at the time healing from a knee injury (slipped & fell on ice!) and he was able to help coach me through the TGU portion of the program so that my injury would not impair my abilities. It was a pleasant surprise to see that Carl more than just held the qualifications I was looking for but was quite proficient in using them as well. His ability to assess and communicate were astounding, definitely an amazing teacher. The only thing I regret about this experience was that I didn't get to work with him longer. I've had neck issues for what seems to be all of my life (I'm 52) and my massage therapist suggested that I might receive some help from Carl. Carl addressed muscle issues in other parts of my body (including my feet and hips!) as well as my neck, showing me how to help find relief from tightness and pain. In the past, I thought being fit was how much sweat I could produce, but Carl taught me differently! I have known Carl for about 2 years. We both worked in the basement of Benningfield Chiropractic. Carl was the personal trainer and I was the physical therapist I watched Carl train a huge variety of people. He is very good at adapting your work out to fit your needs, your body, and your goals. My husband and I just finished 10 personal training sessions learning kettlebell strength training. 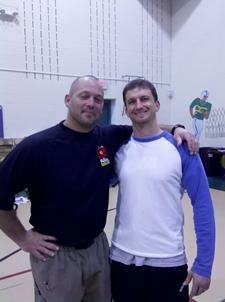 I am a huge fan of his passion for safety and education with developing a personal conditioning program. I recommend Carl to everyone I meet. 10/10 Be ready to learn! If I could, I would rate Carl a 20! He is a wealth of information that he readily shares during your time with him. He isn't in a hurry and doesn't watch the clock. He works with you on your level. Looking forward to my next session and becoming the best me yet - with his help. I've been going to Carl for a little over 3 years now which already says a lot because I have stuck with it. Carl as opened my eyes up to so many aspects of fitness and living a healthy life. He's so passionate about what he does, that it shows in training with him. He listens to what you have going on and he adjusts the workout accordingly. I've never felt better and stronger, and I feel it will just continue. I've reached goals that I never thought possible. I can see in the mirror how my entire body is continuosly changing shape and building muscle tone. Best thing I've ever done!! As a triathlete and full time surgeon my body has both daily challenges and weekend battles. After a mysterious pain put me on the sidelines, I saw PT, Ortho and Chiro to no avail. When I started working with Carl I explained I had no definite diagnosis for the pain, despite all of the help I had sought. "No problem", Carl answered, "We don't have to name a pain to make it go away..."
Well at first I was afraid to hope, but 5 months later I just skiied four days straight and I am pain free. As an athlete I thought I knew balance, symmetry and form issues, but Carl totally transformed my workouts. They are now efficient, goal-based, safe and they get results. If you plan on using/enjoying your body for much longer, you need Carl! I started working with Carl in the spring of 2010. Coming in, I had a lot of stability and mobility issues. My neck and shoulders were constantly aching from simple daily activities, and despite my desire to do strength training, I could never stick with any program because of the inevitable pain it caused me. Carl did comprehensive screens to identify my imbalances and asymmetries. He has a great knowledge of exercise physiology and a sharp eye for identifying weaknesses or inconsistencies in form. Since working with Carl, I’ve lost weight and I’m stronger than I ever thought possible for me. My posture and balance are greatly improved and I carry myself in a much different manner. My views on exercise have changed a great deal: I previously believed that more movement- regardless of quality- was better. Now I understand the great importance of maintaining integrity of movement. I’m no longer plagued by nagging aches and pains and I find that living an active lifestyle is not only easier, but much more enjoyable than it ever was before. Carl has been great at encouraging me to set goals and he works hard to help me reach them. His programming is never boring and always challenging! I highly recommend him to anyone looking for a trainer! is way better than before.